Within the Oil & Gas industry, there is currently very high interest in Big Data Analytics and Data Science. Many of the software applications and toolsets available to the industry today have some form of analytics capability. As these are intended to form the basis of operational decisions, it is important that results are derived from valid data with appropriate quality. 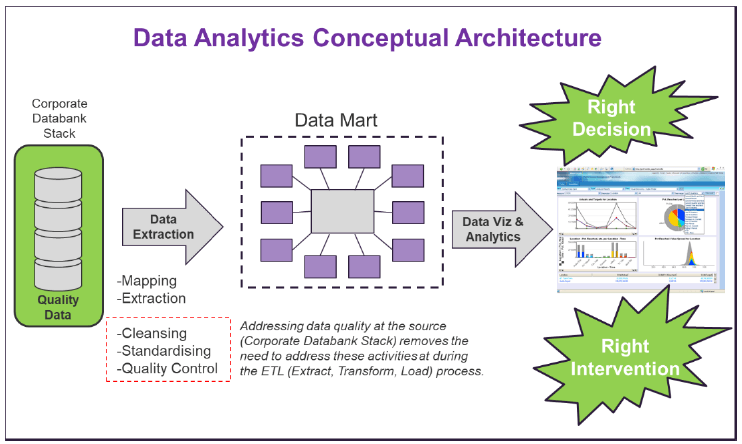 The diagram to the right shows a typical data analytics conceptual architecture that enables data accumulated in the corporate databank (which is likely to be a mixture of static data and real-time operational data) to be analysed and displayed in a visualisation dashboard. Data cleansing and quality control are executed as part of the data extraction from the corporate databank to the central data mart. The key purpose of the dashboard is to enable the right decisions to be made or to empower decision makers to conduct effective and timely interventions. The problem is that there is no flow back of cleansed and quality-controlled data to the corporate databank and so the system of record data is likely to contain errors. A further problem is “error persistence”. 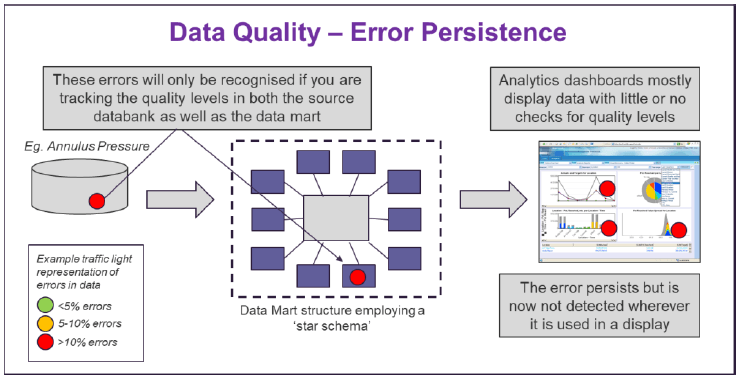 If the data cleansing and quality control processes fail to identify errors in the data extraction process, these will be transferred to the data mart, the analytics routines and the dashboard. So with this model, the quality levels should be tracked in the data mart as well as the corporate databank. The Geologix DQAT workflow is administered by class-leading data quality experts who have the experience to identify all manner of data quality failings. Their goal will be to engineer an optimum data architecture for the client to improve the reliability of the decisions and interventions. 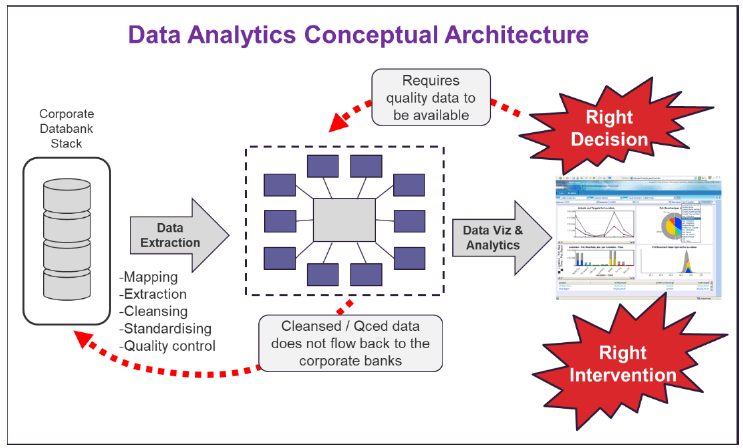 Taking our conceptual architecture as an example, they will refine it to address data quality at the system of record, the corporate databank as shown. This removes the need to address these activities during the extraction process and downstream of it. The result is a much more dependable data analytics solution.